The organisation spearheading the protest action against deep sea oil exploration in New Zealand waters is Greenpeace – a large multi-national corporation with 28 offices around the world, and a presence in over 40 countries. In its 2012 annual report, Greenpeace International claims to have almost 24 million supporters assisting in its environmental activism, and an income of $447 million. Having almost half a billion dollars of funding at their disposal annually, gives them the horsepower to run extremely effective marketing campaigns. They have learnt that the best way to earn an income is to sell emotion – and they have built an extremely profitable business by dramatically elevating the fear and risk of man-made environmental degradation, then persuading the public that sending a donation will help to fix the problem. The Greenpeace website is totally upfront about the way they operate. They state – in what is quite a remarkable admission – that their business is not about education or information, but about activism. Their goal is “motivation not education”. “Campaigning”, they say, “maximises motivation of an audience, not its knowledge. Use education to campaign, and you’ll end up exploring your issue but not changing it. Information is not power until it leads to effective mobilisation.” By giving people only a bare minimum of essential information about an issue, Greenpeace has learnt it is easier to persuade them to get angry enough to act. Greenpeace campaigns are painstakingly planned to carefully target women and young people. They describe campaigns as a creative and a technical process – an art and a science. They warn that no campaign should be started until the strategy has been tested, and they recommend using two types of research – qualitative research to investigate language, and political research to investigate “obstacles, decision-making, attitudes of key individuals, potential allies and opponents”. Qualitative research enables campaign messages to be massaged to better manipulate target audiences. An example quoted explains how qualitative research was used to discover the way to mobilise women to campaign against the destruction of the ozone layer. The key issue wasn’t the usual ones mentioned in policy debates – such as the increase in skin cancer, or the damage to fisheries, Antarctic wildlife, or even whales – it was the fact that women were concerned that the ozone hole was threatening holidays: if ozone-destroying chemicals made it dangerous to spend two weeks in the sun, then they should be banned! Greenpeace believes that conflict is central to any campaign, and if it can encompass a sense of scandal or outrage, then it will be even more effective. The New Zealand arm of Greenpeace has a funding base of over $9 million, with 96.2 percent of their financial support coming from direct deposits donated by over 52,000 regular supporters. They have an army of paid fundraisers – “good people to step up and go on this journey with us” – working full time as street teams from 9am till 5pm, as door teams from 1.30pm till 8.30pm, or as travelling teams to visit smaller communities all over New Zealand. They also have 2,500 registered volunteers organised in regional networks throughout the country, to drive their campaigning efforts. In their current campaign against deep sea oil drilling in New Zealand’s coastal waters, Greenpeace is using the fear of a catastrophic oil spill – on the scale of the one that occurred in the Gulf of Mexico in 2010 – to turn the public against oil exploration. In October they released an analysis of deep sea oil spill scenarios for New Zealand waters, based on the potential for a Deepwater Horizon scale of well failure. Their model, which showed a significant impact on the shoreline for nearly the entire west coast of the North Island, was dismissed by the government as being inaccurate. Following the release of their report, the next stage of their campaign was to send protest vessels into the drilling zone, to stage beach protests, and, once exploratory drilling began, to file papers in the High Court seeking a judicial review to halt the drilling by claiming that the regulator had failed to examine “key” documents. “With regard to the possibility of a spill of the magnitude and duration of the Deepwater Horizon occurring here, we have to ask do we have that size of reservoir, that type of oil (light), and under those sorts of pressures (very high) that resulted in that massive spill when well control was lost. The answer is probably not – many of our oils here are very waxy, are not under huge pressure, and indeed have to be ‘coaxed’ from underground including by using pumping and sometimes heating. The reality is that a catastrophic disaster associated with the present exploratory oil drilling – of the magnitude being promoted by Greenpeace – is extremely unlikely. However, rather than letting the facts get in the way of a good campaign, they have grossly elevated the risks in the minds of an impressionable public. It is important to remember that the petroleum and mining sector is the backbone of many of New Zealand’s local economies. In Taranaki, the petroleum industry employs almost 4,000 people directly, and 1,500 in downstream jobs. With crude oil being the country’s fourth-largest commodity export, Taranaki has now become the highest paid workplace in the country with an average salary of $80,269. Roles in the mining, resources and energy sector – currently the highest paid industry in the country – have an average salary of $103,275, some $30,000 above the national average. Not only is the Taranaki region prospering on the back of the oil and gas industry, but dairy-farming and tourism are thriving there as well. The fact that all three industries are able to operate successfully side by side dispels the myth that exploration industries are incompatible with our ‘clean, green’ image. New Zealand’s involvement with oil and gas exploration goes back a long way. The first exploratory well was dug in New Plymouth in 1865, but it was 1904 before a drilling rig was brought into the country to begin commercial production. New Zealand is presently regarded as one of the few remaining potential, untapped oil and gas frontiers in the world with 1.5 million square kilometres of our 6 million square-km territory known to be prospective sedentary basins. There is an expectation that world-scale reserves of oil and gas could be found, although they would clearly take years and billions of dollars to develop. Already the petroleum industry is worth around $2.5 billion a year, with corporate tax and royalties worth $750 million a year, and that’s from fields estimated to contain tens of millions of barrels of oil or less. With the potential for new discoveries in the region of hundreds of millions, if not billions, of barrels, the returns could be massive. The Canterbury Basin prospect has the potential for a huge gas field discovery that could transform the South Island economy. Over the next 12 months, companies involved in oil and gas exploration – including Texan oil company Anadarko, New Zealand-owned Todd Energy, the Austrian company OMV, Australian firm AWE, Canadian-based Tag Oil, and the international giant Shell – are expected to spend close to $2 billion on exploration. 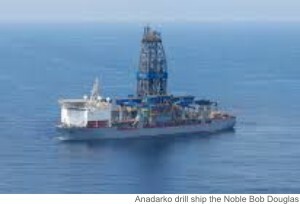 Anadarko alone will spend around $100 million as it drills for oil in 1500 meters of water, 110 nautical miles west of Raglan, in a 24 hour a day operation at depths of up to 4,600 metres. Early next year their drill ship, the Noble Bob Douglas, will move to the Canterbury Basin. The Government has made no secret of the fact that it believes an expansion of the oil and gas industry would provide huge benefits to the country. In readiness for the expected increase in prospecting, the Crown Minerals Act was updated in March. The new law includes a prohibition to prevent protesters from entering a non-interference zone of 500m around mining activities. The fact that Greenpeace breached that exclusion zone during its recent protest action is a matter for the Police to consider. Their track record suggests that breaking the law is likely to have been a planned part of their campaign. If charges are laid, the offenders could face fines of up to $10,000. But they might want to reflect on the situation of their Greenpeace associates who were arrested while protesting against deep sea oil drilling in Russian waters. While the original charge of piracy with its 15-year prison sentence has been dropped, they still face charges of hooliganism, which carries a maximum term of 7 years in jail. Without a doubt, Greenpeace is highly effective at manipulating the emotions of its target audience – and using misinformation to perpetuate an escalating presence. But the destruction of livelihoods and the opportunity for families and communities to get ahead, that can result from its campaigns, is arguably more manipulative and damaging than the multi-nationals it likes to criticise and condemn as immoral. Do you believe environmental activists like Greenpeace are having a positive, negative, or neutral influence on New Zealand?